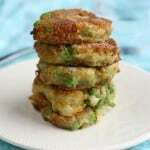 Home » Appetizers » Spiced Samosa Patties. These easy to make spiced samosa patties are dairy free and vegan! 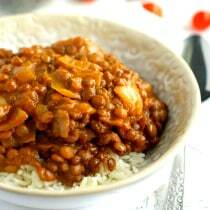 A delicious twist on a traditional Indian favorite. Who loves samosas?! Who’s ready for a vegan, gluten free, healthier version of a samosa? I am! I was thinking about Indian food, and how much I used to LOVE potato and pea samosas. There was a little Indian grocery store across the street from where my mom used to work that sold samosas at lunch time, and I would run over there and get a samosa or two and take them to my mom and we’d have a quick snack. Now that I don’t eat wheat, I can’t eat samosas. They are wrapped in a thick dough, and then deep fried, so I actually have not had a samosa in five years. These are very tasty, a little spicy, vegan, and gluten free. 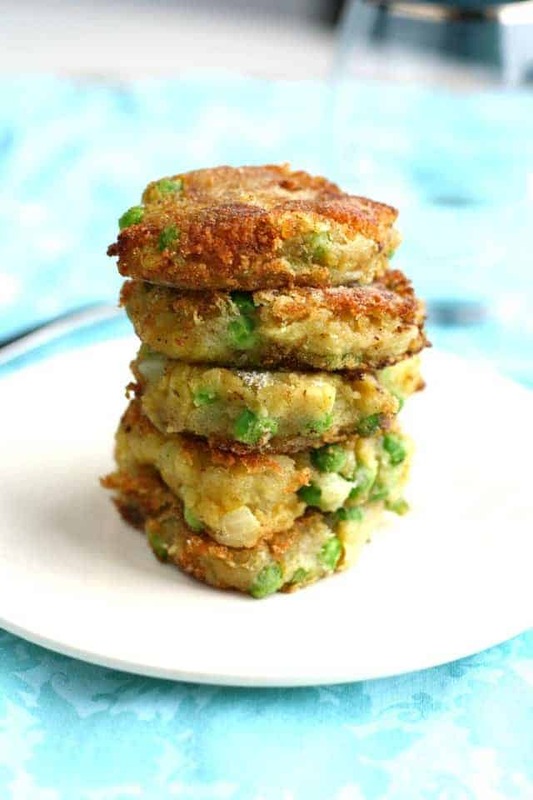 You can make these samosa patties tonight…you probably have all the ingredients already! All the goodness of an Indian samosa, but none of the gluten! In a small pan, cook the peas and onions in one tablespoon of buttery spread over medium heat until onion softens, about 5 minutes. Place the baked potatoes with the skin off in a large bowl. Once the peas and onions are cooked, add them to the potatoes. There will be a little liquid in the pot, go ahead and add that to the potatoes, too. Add the curry powder, salt, pepper, and one tablespoon of buttery spread to the potato mixture. Use a potato masher to mash it all up. Place the gluten free flour and a few dashes of salt in a small bowl, set aside. Line a plate with paper towels. Heat the remaining tablespoon of buttery spread and the two tablespoons of canola oil in a frying pan over medium heat. 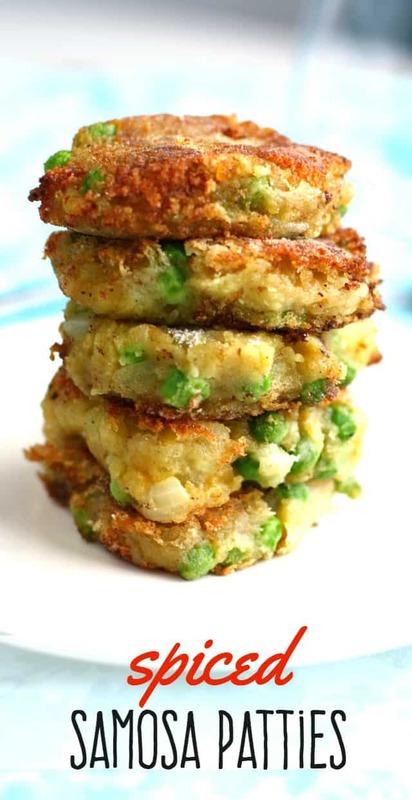 Form the potato mixture into small patties and dredge them in the gluten free flour. Once the oil and buttery spread is sizzling, place a few patties in the pan. Cook until golden brown, about three minutes on each side. Once they are cooked, place them on the paper towel lined plate to drain. Repeat with remaining patties. Serve warm. Makes 8 small patties. « Vegan Chocolate Coconut Cake with Rich Chocolate Glaze. I haven’t made it yet but it sounds so delicious. Can’t wait to try it. Can I use normal potatoes? These were fantastic! Thanks! I haven’t made samosas since going gluten-free. Used to serve them with a tomato chutney, so good. Adding this into rotation. Superb! Also, once done, we fried up the potato peels with some of the dredging flour and garlic. Nothing gets wasted, made a nice snack. What a great idea to use the potato peels! Oh my gosh! These are sooooo good! Thank you! Do you have a suggestion for a healthy dipping sauce to go with these, please! Not that they need any! Just curious! I’m not sure! Maybe some kind of yogurt based sauce? These look awesome! I’d like to try them as an appetizer. What kind of vegan/vegetarian dipping sauce would you serve these with? Oh my what a perfect summer recipe. It is great that you include the nutrient facts. So helpful! These samoosas are a flop. I waisted my ingredients. They kerp break8ng in pan no mattdr what i do. Just made these the other day! SO SO good. Maybe it was because I was using regular flour, but I found these worked much better when I mixed the flour (just over 1/4 cup) into the potato mixture instead of dredging them. Will definitely make these again, thanks so much for the recipe! Made this recipe tonight. It’s so great! Thank you for giving us a samosa alternative. Yay, I’m glad you liked these! Thanks for letting me know. These were delicious but not at all crispy. I may try baking them next time. Thanks for the recipe. The outside should get a little crispy, but they stay soft inside. If you try frying them again, you may want to get the pan a little hotter before adding the patties. I grew up eating indian food as I am indian. Just wanted to let you know samosa patties are not a new creation…. they’ve been around ever since samosas. 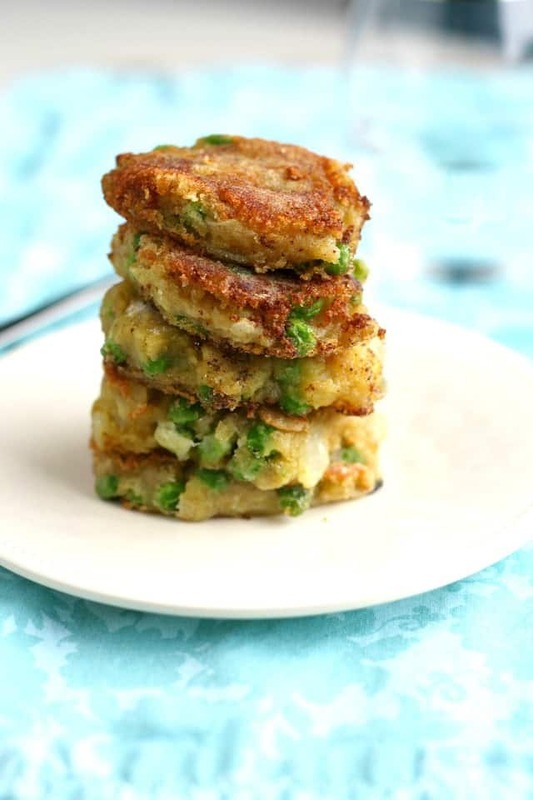 It’s called aloo tikki meaning potato patty. Good on you for sharing though. My son is Celiac, and I can’t wait to make these for him. I was just wondering though – instead of baking the potatoes, can I boil or microwave them? I’m thinking it might be quicker, but I don’t want to sacrifice the taste. I think microwaving them would be fine! Boiling may make them a little too wet. How long did you bake the potato? And did you leave the skin on when baking? These are good but any reason mine fell apart? How flat of a patty? My daughter sent me a picture of these today and I said these are dinner tonight! You were correct, I had all the ingredients to hand. I boiled the potatoes versus baking them as I was short on time and it seemed to work alright as they were very tasty. Also didn’t add the peas and onion mixture until I mashed the potatoes as I wanted the peas to be whole but other than that followed the recipe. I’ll be serving these to my vegan daughter in the not to distant future. Thanks. I’m so glad to hear that you liked these! Thanks for letting me know! Great recipe! This is actually quite similar to what is called “Alu ki Tikki” or potato pastie, and not a samosa. Yes it is an alternative to a samosa, but it is not a samosa pattie. Good recipe though, Thanks for sharing. Can I sub the gluten free flour with regular flour? Wow. Just made these.absolutely delicious! I soaked 2 tbs of chia seeds in 3 oz water for 5’minutes and added it to the my just to bind everything a bit better. The patties held together beautifully in the pan and everything tasted amazing! Yay, so glad you liked the recipe, thanks for letting me know! I made these for my dinner tonight. I’m eating them right now, very flavourful and delicious. I used a bit of chickpea flour in the mashed potato mixture as well as some gluten free flour blend. I didn’t read the instructions thoroughly and mixed it in with the potato, pea and onion mixture, worked just fine! They browned up nicely and held together. So glad you liked them! LOve that addition of chickpea flour! I can’t wait to try these! Going to make them this weekend! Would chickpea flour work okay? It might be fine, but I haven’t tried it! Let me know if you do! Yay! So glad you liked them! thanks for letting me know! Hi! This looked delicious so I had to try it! My only problem was that once fried, they really didnt hold their shape at all so couldn’t eat it like a patty, had to use a spoon. Any idea why? Hmm, I’m not sure, but maybe the potato was a little too wet, or not enough potato was used? Love this! Was delighted to see a fellow reduxer on my hunt for samosa bites I’m making next weekend…thanks for the inspiration! You’re welcome! Samosa bites sound yummy! Love samosas!! These look and sound fabulous! Indian spiced turkey burgers sound amazing! Yum! Thanks for stopping by! Love that everyone did a version of the patty you mentioned at the top of your post (including peppermint) and your recipes sounds delish!! These look SO good! Pinning this for later, for sure. I love samosas and this is such a quick and easy way to make something similar. YUM! I love these! 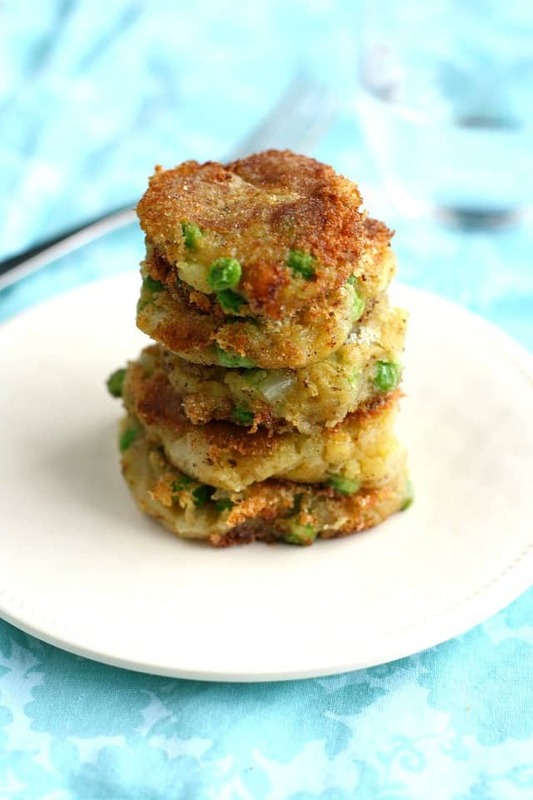 Peas, potatoes and gluten free. These sound delicious Kelly! I can see myself putting this in a pita with some veggies and greek yogurt. Yum! Thanks, Natalie! They would be good in a pita! Yum!